When we think of September, most of us think of back to school, back to work, back to routine, summer is over, and the days start getting shorter. We are back to ‘schedules’ and start forward thinking to the upcoming holidays. Slow down! Even though the days feel a little shorter and it gets dark a little earlier, the weather in September and October is usually still very accommodating to enjoying your outdoor spaces. In fact, many people think this is the best time for entertaining and cooking outdoors. The cooler temps and less humidity make ideal conditions for cooking and dining outdoors. With this in mind, let’s go over the ingredients for the perfect outdoor kitchen. There are many things to consider and ask yourself when extending your living and entertaining space with an outdoor kitchen and dining area so that is suits your lifestyle needs. One of the first to consider is your cooking style. If you find yourself running in and out of the house while you are grilling, think about what elements you use while cooking so they can be incorporated outdoors. Most grill manufacturers have a wide variety of products available to duplicate indoor cooking elements for outdoor use. Elements ranging from side burners, pizza ovens, and turkey fryers to refrigerators and beer kegs are all available to be incorporated into your outdoor kitchen. No matter what kind of cook you are, there are endless possibilities to match your needs. Once you hone in on what elements you want in your outdoor kitchen, the next consideration is layout. There are questions to ask yourself for this part as well, such as; how many cooks do you need to accommodate in this space? Most people have one ‘cook’ in the grill area, but with all the options available to duplicate indoor cooking outdoors, there is room to consider a layout built for two! The same questions and considerations when planning an indoor kitchen apply when planning the layout for an outdoor kitchen. The kitchen ‘triangle’ concept applies to outdoor kitchens as well. You want your cooking area, refrigeration, and sink in an unobstructed triangle. Since most outdoor kitchens are smaller than indoor ones, this is usually pretty easy to achieve without trying too hard. When deciding on outdoor cabinets and drawers, the most important question to consider is what will withstand the elements the best? Water resistance is the name of the game when considering your options. There are other cabinet and drawer materials besides stainless that are available; although stainless is the most commonly used. Teak and other hard woods can be used as well because they perform well in this environment. Marine-grade polymer is another material being used for cabinets for their overall weather resistance qualities as well as for color options. Speaking of color, there are even some manufacturers that offer special finishes on stainless steel that can not only provide color options, but also simulate the look of real wood. Counter-tops seem like an easy decision but I do want to cover a couple of points to consider. Besides having counter-top space for prep work and cooking space, it is also important to consider if you want to incorporate counter-top space for using as a bar, serving area, or eating space. This is easy to incorporate into the planning but important to consider. Most guests like to congregate where the food and drinks are as well as socialize with the cook(s). We can make that happen with the right layout! As far as counter top materials, there are many options here too. Granite is the most widely used material for its strength and durability. We have seen concrete used as well, but like granite better for its stain resistance. 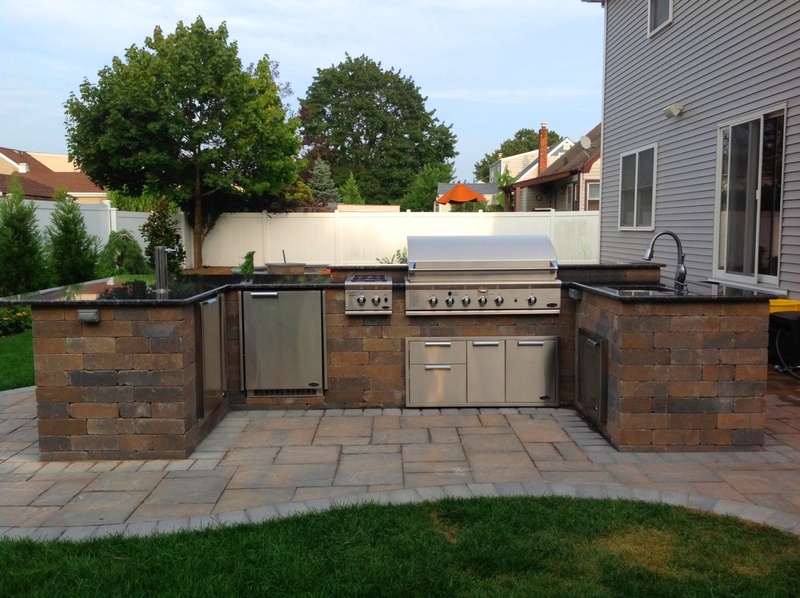 The placement of your outdoor kitchen shares equal importance to the layout. You want it to be in an area that is convenient for use as well as providing an entertaining space. If you are going to have an outdoor dining table and chairs nearby, that should be taken into account too so that proper spacing can be determined. A structure such as a pavilion or pergola can not only provide a dramatic definition of space, but can also provide shade. With the use of some sort of structure, even a small pergola over the grill area, lighting fixtures can be incorporated for function, accent, and beauty. The most common layouts are listed below and the possibilities within each one are diverse and plentiful. Straight line / Island type kitchens: The name is pretty self-explanatory. This clusters the grill and any other appliances in a straight line or island. This can be placed against the house or as an island to create an entertaining space by lowering one side of the counter-top to separate the cooking and social/eating areas. U-shape and L-shape: for larger outdoor kitchens, these shapes are commonly used to incorporate all the appliances, cabinets, and drawers as well as entertaining areas such as a bar or counter seating. Free form shape: Another option for larger outdoor kitchens. Using a free form shape can be used to follow the lines of the patio or just to be unique. The most important ingredient: Choose a professional installer. You are making an investment in your home as well as creating a space for your cooking and entertaining enjoyment. A professional can help design the best layout and space planning for your individual needs. 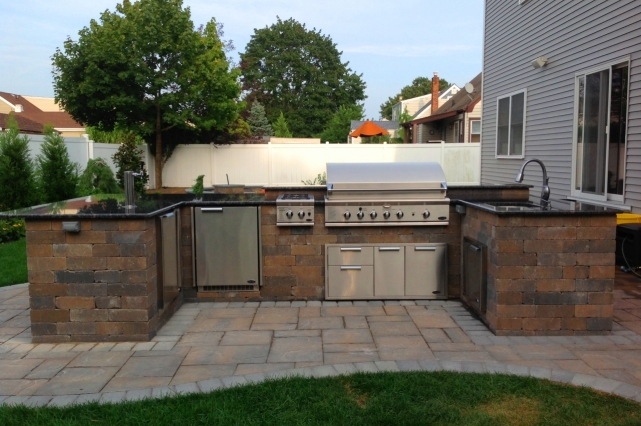 Choosing a professional to design and install your outdoor kitchen will ensure quality products and installation practices are used which will provide years of use and enjoyment.